The first time I remember hearing the word "steampunk" was when Will Smith and the gang came out with the new "Wild, Wild West" movie back in 1999. Wow, that was...almost twenty years ago! Even though the trend was started some time ago, it continues to flourish in a variety of ways. I have quite a few students who really like reading steampunk young adult fiction. I had never tried it, however, until recently. 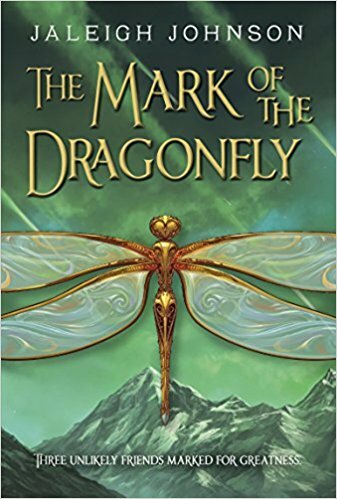 One of my students, who has heard me say I'm an open-minded reader and will try anything once, gave me a well-worn (well-loved) copy of The Mark of the Dragonfly by Jaleigh Johnson. I asked what kind of book it was, and she told me it was a fiction mix of steampunk and fantasy. She had heard me say that I've experienced steampunk in movies and music videos and fashion, but I didn't recall ever reading a young adult novel in that genre. My student wanted to make sure she bridged that gap in my education, for which I am grateful. 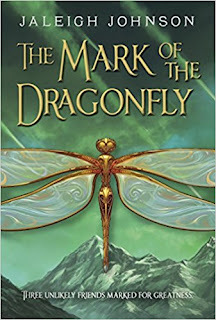 The Mark of the Dragonfly is about an orphan girl, Piper, who lives alone in an old, dangerous, poor, steampunk-type world. She is a strong, likable character who doesn't take crap from anyone and has a bit of a sarcastic streak (two of my favorite characteristics in a girl). Piper has a talent for understanding mechanical things and has the tools and ability to fix them. This, of course, makes her very valuable in a worn-out world where new things can't be bought, and all things must be repaired. One day, while trying to help a friend who is mining in the junk fields, she sees a caravan get hit by something falling from the sky. She manages to help rescue a couple of people from the wreckage, which ends up changing her life and forcing her into an adventure she was not prepared for. She makes some new friends along the way,...but she makes some new enemies, as well. I enjoyed the novel, and I could understand why my student loves it. She had a another student, a boy, to read it before it reached my hands. She wanted to 'make sure guys would like it, too', and he did. Since I've read it and returned it, she's passed it on to others. All of the readers enjoyed it and gave it good reviews. I do apologize for not posting much since the beginning of the new year. Life took a couple of unexpected turns. First, I was pretty sick - which is very unusual for me (the last time I had to take time off from work for sickness was 2009). I won't go into all the details, but I caught one of the horrid viruses going around here and, even after I recovered, I had trouble getting my body completely back to normal. Thankfully, I'm fine now. That's all for now, see y'all next Sunday! Happy reading!